If you follow my blog you know I'm obsessed with Patterson Mountain in Winthrop, Washington. 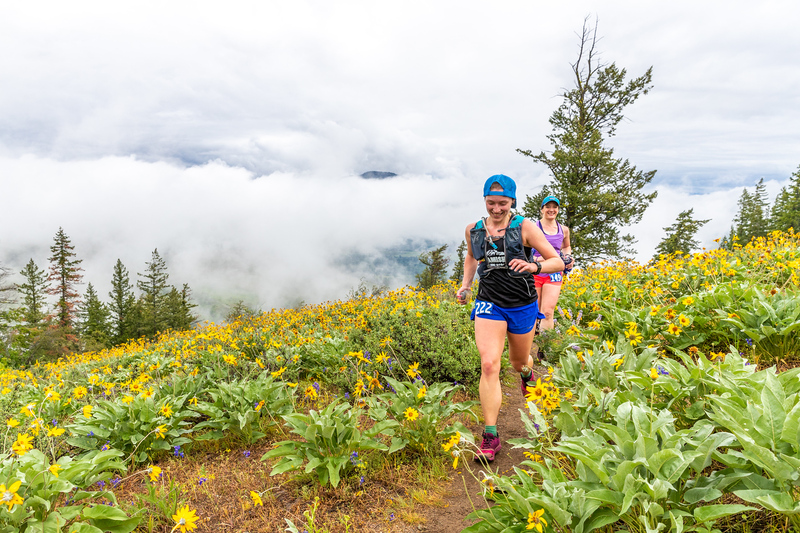 One of my favorite races in the PNW, Sun Mountain, takes place climbing up and down Patterson and looping many gentler trails around it. 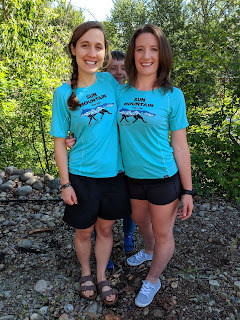 I've raced Sun Mountain previously (25k - 2014, 50 Miler - 2015, and 100k - 2016). Saturday was my first stab at the 50k, which is now the longest distance available. Having run and loved this race in prior years I promoted it heavily to friends. I had talked Bethany into registering for it with the intent of it being her first 50k. 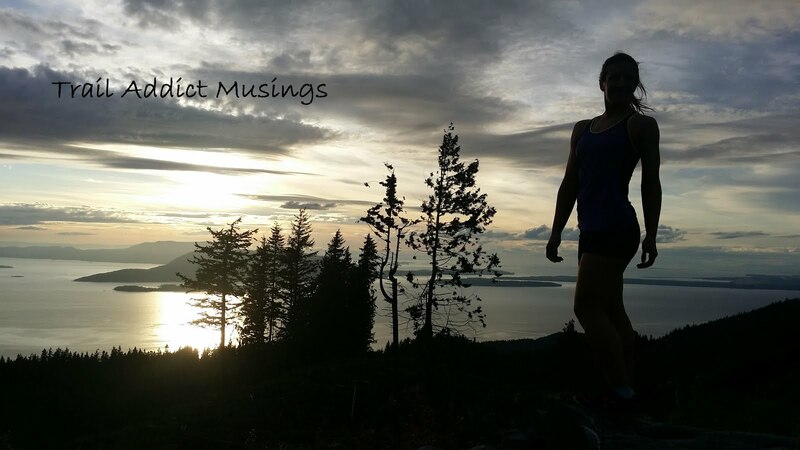 She got excited about that goal though and ended up running the Chuckanut 50k first in March. Similarly, I had talked it up to Ali. She was able to buy a bib last minute. A big group from Bellingham came over to race and it was great to have so many friends there. Bethany was my roomie and Ali ended up sticking with me for the entire race. I went to Winthrop for a solo day trip the prior weekend for Mother's Day. The pass had just opened and I was excited to get one run in on the course before race day. It was 86 degrees in full sun and I just about melted. I set my sights low for the race thinking I wouldn't be heat acclimated at all. By race day the weather reports changed drastically. We were in for rain with highs in the low 60s.The rain fell hard all night on the eve of the race. Our cabin was next to the river so between its nearly overflowing banks and the pounding rain we slept to nature's live version of those white noise machines owned by people like me seeking peaceful sleep in apartment life. We stayed up too late, midnight or so, with 5:30 am alarm clocks for the morning. We had an important mission: sharpie tattoos. Bethany is the artist between the two of us and had a bacon heart designed for me. She signed it B12, one of my nicknames for her (just being around her will give you a shot of energy much like B12 injections claim to do). She also wrote run faster on it because she thinks all I need to finally meet my sub 7 hour 50k goal is some convincing. I suffer from an artistic talent deficit so I sharpie sketched a slightly lopsided heart with a pickle and a bacon slice in it on her arm and wrote run fasterer on it. Why the fake word? Well she's already damn fast and we get in enough grammatically correct communication during the work week. Morning came too quickly and we were at the race start before we knew it. Sun Mountain always used to start and finish at the Chickadee Trailhead, but James revised the course to start and finish at the Patterson Lake Cabins this year. The perk of this was fewer mosquitoes and the beauty of the lake. The it place at any race start is the porta potty line so off we went...and promptly saw a large brown bear trying to get into the adjacent dumpster. It was ignoring us completely, including James when he went up close and yelled at it to get out of there. A few people, whose line of sight did not include the bear, thought he was yelling at someone to get out of a porta potty so we had a good laugh at that. I just kept thinking about the dozens of times I'd run right there by myself without my mind on bears. Rattlesnakes are what I'm used to watching out for there. While I technically never ran the 50k at Sun Mountain before I sort of ran it twice in 2016 because the 100k was simply 2x the 50k loop. Back then the Patterson Climb was late in the race. The revised course sent us straight up Patterson after maybe a third of a mile on the road. Unfortunately, the road section was too short to thin out 300 of us so we came to a full stop waiting in line to begin the single track climb. I almost paused my watch before remembering it was a race and not a training run. Going up as we did didn't allow running. On one hand I felt stressed to lose time so early by being forced to hike rather than run/hike interval the climb. On the other hand I liked the no pressure atmosphere of not being able to run it and reminded myself that the climb was not quite 2 miles of 31 and it would even out. Ali and I were sticking with our friend Tim in this section and had fun on the way up. The loop turns off to an out and back summit where we got to see Bethany, Cam, Kelly, and Nichole fly down. 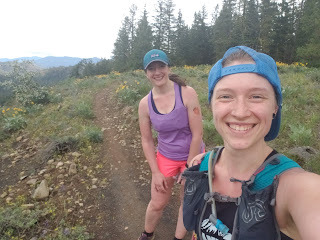 After completing the summit we descended the opposite side of the loop to a trail appropriately called Black Bear that would take us to one more big climb on a trail called Moose up the backside of the Sun Mountain Lodge where we would find aid station one at mile 7.2. I didn't tell Ali, mostly because I knew she'd offer me her water and I didn't want to waylay us, but about 2 miles before the aid station I felt it was a mistake to have gone handheld only and no pack. I was thirsty, however, this was the only section of the course I'd predicted would be a problem. Every other section was shorter with less climbing. I drank a full bottle of water and coke and refilled before leaving aid and it wasn't an issue thereafter. A few miles past aid one we entered the buggy section. I felt like I was getting bit constantly. Ali kept hitting me to help chase off the mosquitos, but they were relentless. During this section Ali's stomach was bothering her and we thought it was the ginger ale from the aid station. Cupless races are a great trend, but both sodas we drank were super bubbly since they hadn't been sitting around in Dixie cups getting flat. Getting in to aid two around mile 13.2 we spied a man with green can of OFF mosquito repellent. We sprayed each other quite enthusiastically, but having trouble breathing for a moment in the chemical cloud was completely worthwhile. Post race my mosquito bite count was 25, 15 grouped on my back and another 10 on arms and legs. It would have been worse if not for the man with the OFF. Stopping to smell the flowers, both figuratively and literally. After leaving this aid station I began trying more fervently to talk Ali into abandoning me, but she kept refusing. She had a crafty way of turning it back around as if it was likelier I'd leave her. I have a complex about slowing other people down. Ali and I train at basically the same pace, but unlike me she also has a race pace. I have no race pace. Sometimes my training pace works out to be faster than my race pace. That's not how it is supposed to work. I set a time goal, then partway into a race I realize I'd rather not push and feel like crap so I lollygag through the woods and accept whatever time shakes out. Then I complain later that I was unable to meet my initial time goal. I've finally gotten a bit wiser with this and admitted unable is not it. I am unwilling to meet my time goals because I prefer to be social, stop and smell the flowers, take photos, and have fun. That said I still have a lofty goal at the start of every 50k. This one was my 9th 50k and I have not cracked 7 hours ever. The goal is sort of arbitrary and sort of a key performance indicator tied to my ability to run the distance I most want to finish. 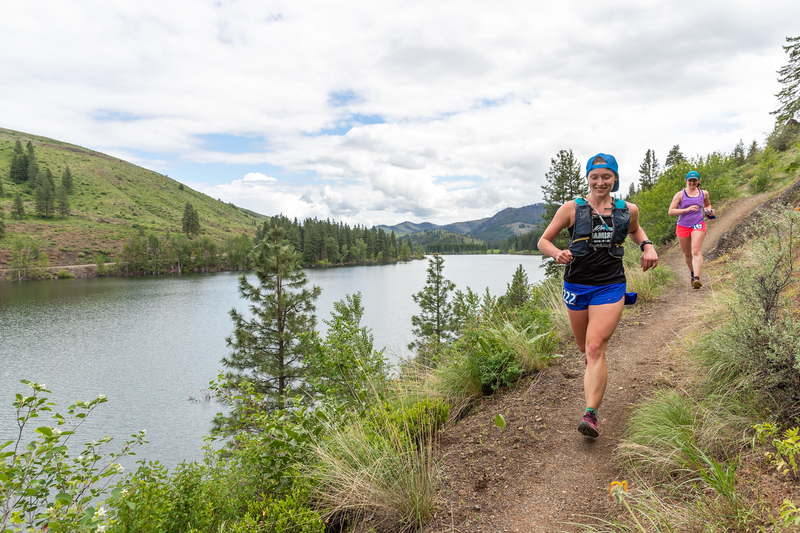 My one DNF, the Mountain Lakes 100 miler in 2015, where I was pulled from the course at mile 82 sorta injured, but mostly slow as mud 27 hours and 46 minutes into the 30 hour cutoff, led me to formulate my 7 hour rule. The 100 mile distance has a strong law of diminishing returns. You can't just take your 50k time and multiply it by 3.3 to predict your 100 mile finish. You will slow down. A lot. You can't double your 50 miler time either. If that was the math I could run a 25 hour 100 miler and I assure you that will never happen. All this math play leads to my rule. I'm not allowed to attempt a 100 miler again until I first run a sub 7 hour 50k. I didn't get into that level of detail with Ali about my target. I just mentioned that I'd buy dinner from East 20 Pizza that evening if she could force me err I mean pace me to a sub 7 hour finish. She had come to run for fun, not race, because she is tackling the Rim to Rim to Rim run across the Grand Canyon and back this weekend which is close to 50 miles and in an extreme climate. A 7 hour 50k isn't race pace for Ali though so she was all in to help me. Rather than get into the details between mile 13 and mile 31 I'd rather defer to Ali who made me laugh so hard with a few tears mixed in while reading her blog write up of our race She captured everything that makes an ultra great. Please read it here it makes my heart smile so much. The last hour of the race, after I gave up on my time goal a couple hours prior, Ali pushed me. I recall one hill climb where she instructed me it was time to start passing people between there and the finish line. As I passed I told another woman that she couldn't see the string (there was no string), but that Ali was pulling me up the hill. I'm pretty sure she thought I was crazy, but in my head that was what was happening. Throughout the day each time I was in front I ended up asking her to get back in front. It just helped so much with motivation. Ali motivating me down Rader Creek. We descended Rader Creek at the best pace we'd had all day. Ali doesn't really get warmed up until after mile 20 so she was at her best and working hard to motivate me to the finish at a respectable speed. Once we hit the lake trail I crashed again mentally. 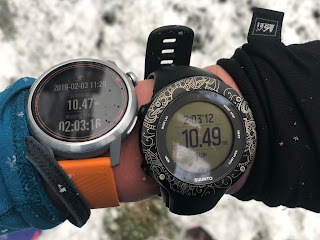 I've run it as an out and back many times so I knew our mileage to the finish was going to put our watches closer to 32 miles, eliminating the 7 hour 15 minute finish I'd been hopeful of descending Rader. It made me want to give up on even trying to beat my fastest 50k (Rattlesnake Ridge 50k - 2015 - 7 hours 26 minutes 48 seconds) at all. This is when Ali started treating me like her dog, Rhys. There were rolling hills along the lake and she'd go up one, pause, and call out, "C'mon Jenny c'mon." She was thinking there was a strong risk I might get mad about that, but I say do what works I love creativity and I love my friends. Almost to the Finish. Photo Credit: Glenn Tachiyama. Finally, the lake trail intersected the Cabin trail which meant only a few downhill switchbacks and the finish line. We only had minutes left to trim anything off my old best 50k. I faintly remember pausing and shouting something about how we had 4 minutes, but I was ready to drop the hammer and do this thing lets go. So we did and full on sprinted at the end. 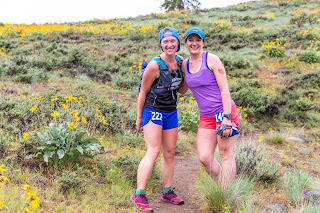 We were holding hands at my insistence on the basis that I could not have gotten there then without her until we saw another racer in our way. Neither of us think the within 100 meters of the finish line pass is a classy move, but this was a special case. We let go of each other and jumped off to the side to pass and book it in. Sprinting to the finish together. Photo by Bethany. Finish line recovery Charlie style. Lake + Beer = Recovery. Photo Credit: John. One more sharpie tattoo for the road. Post race rest and relaxation. Post race fun in the sun for my shorty.